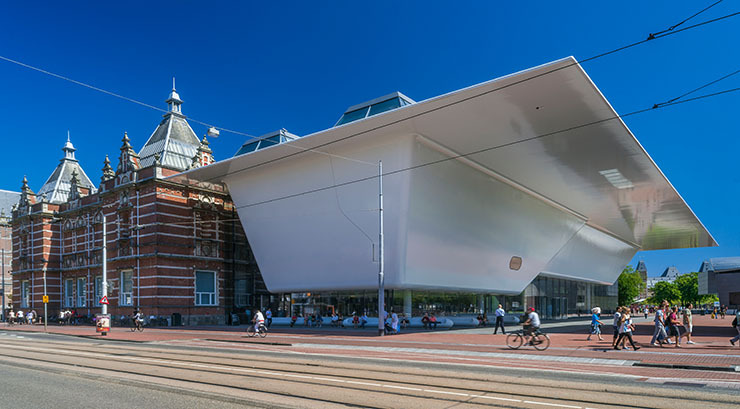 The Stedelijk Museum Amsterdam (SMA) is looking for an Artistic Director with a vision on the changing role of the museum in the 21st century. The SMA is situated in the bustling heart of Amsterdam’s cultural centre: ‘Museumplein’, where the most prominent museums in Amsterdam are located. The SMA is a place where a broad and diverse audience can discover and experience modern and contemporary art and design. The SMA manages a unique collection. Its role in providing a platform for contemporary art is legendary. During the past few years there have been several management changes. A new board has set out an optimistic and ambitious course for the future. The SMA staff is fully committed and is looking forward to a new artistic leader. The SMA’s mission is to enrich people’s lives with modern and contemporary art and design. The collection, exhibitions, publications, research and educational programmes offer new insights into the present – both at an individual and a social level. The SMA foundation has a Supervisory Board whose members are appointed by the College of Mayor and Aldermen of the Municipality of Amsterdam. The Supervisory Board is the employer of the Executive Board and appoints its members. The Executive Board consists of two members: an Artistic Director and a Business Director, who have complementary profiles and are jointly responsible for the entire management of the SMA. Both directors must unconditionally endorse the primacy of the artistic content and the responsibility for sound business operations in all respects. The Executive Board reports to the Supervisory Board. The SMA is looking for an inspiring Artistic Director, who is able to continually position the SMA as a vibrant public institute: socially relevant in the here and now and ranking among the world’s leading museums for modern and contemporary art and design. The Artistic Director is a leading figure in the Dutch and international art world. The Artistic Director is an inspirational sparring partner for the dedicated and involved staff of the SMA. Furthermore, he/she will understand and stimulate the SMA to be managed in a successful manner where financial results and employees are concerned. * To articulate an outlook on the social significance, stance and role of a museum of modern and contemporary art and design in today's world and in the future. * To develop a vision regarding the conservation, management, development and mobility of the SMA’s collection. * To provide comprehensive programming, to reach a wide range of audiences and have horizon-expanding discussions, pass on knowledge, stimulate research, documentation and publications. * To foster a constructive relationship with public administration, art institutions, fellow institutions, academic and post-graduate training institutes, partners, funds, art critics and the media. * To maintain good relations with key players, also to interest sponsors and the wider public in the museum and to involve them in the museum on a long-term basis, while upholding artistic independence. * Proven and recognized artistic leadership in a museum or other important cultural institution in contemporary art and design. * Has an excellent international network and has good relations with established and emerging artists. * Has proven to be an effective leader and team-player and has a holistic view of general management. * Can articulate and communicate artistic policy clearly and convincingly. * Knows the national and international art world from a historical perspective. * Has a keen eye for artistic innovation. * Is sensitive to the issues of diversity and inclusion. * Is aware of the SMA's role as a public institution and understands the sphere of influence of public and private funding in which the museum operates. * Is aware of political, societal, technological and demographic developments. * Is sensitive to the demands of audiences and to the specific role of the museum in Amsterdam and in society, in a broader sense. * Has an in-depth interest in the SMA's collection. * Is a powerful and inspirational figurehead for the museum. * Endorses the core values of the SMA: curious, individual, open, ambitious and enterprising. * Has a great sense of responsibility for the continuity of the SMA. * Has the ability to take the lead. * Quick, intelligent thinker and doer, a good judge of character. * Has catching enthusiasm that brings people together and prompts them to perform as well as possible. * Is an inspiration for people, encourages new ideas and out-of-the-box thinking. * Bridge-builder, connector, director who allows teams to excel. * Independent, loyal and honest. * Has a good sense of humor and knows how to put things in perspective. * Written and oral communication skills in Dutch and English; knowledge of other languages would be a major advantage. * Prepared to settle in (or near) Amsterdam. Maes & Lunau Executive Search will support Stedelijk Museum Amsterdam throughout the selection procedure for an Artistic Director. Deadline is Friday, 22 February 2019. The aim is to finalize the appointment of the new Artistic Director within the first half of this year.